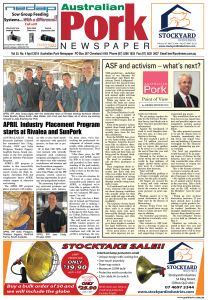 Australian Pork Newspaper is posted free to pork producers or industry associates Australia wide. For a non-industry subscription or located outside Australia, subscription costs apply. Please fill in the form below to have Australian Pork Newspaper posted to you each month. For a digital version of APN please sign up below and you receive an email when the latest edition is available. © 2019 Australian Pork Newspaper is published by Collins Media Pty Ltd and may not be copied or reproduced without permission. Views expressed in this publication are not necessarily those of the publisher.